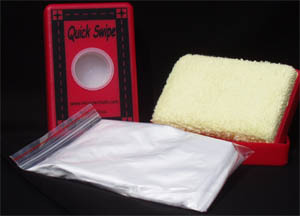 Kit includes 2 oz of Miracle Chalk Powder (white only) and a Quick Swipe Marking pad. Place the stencil on the fabric. Use one hand to hold the stencil firmly in place and SWIPE the pounce over the stencil. 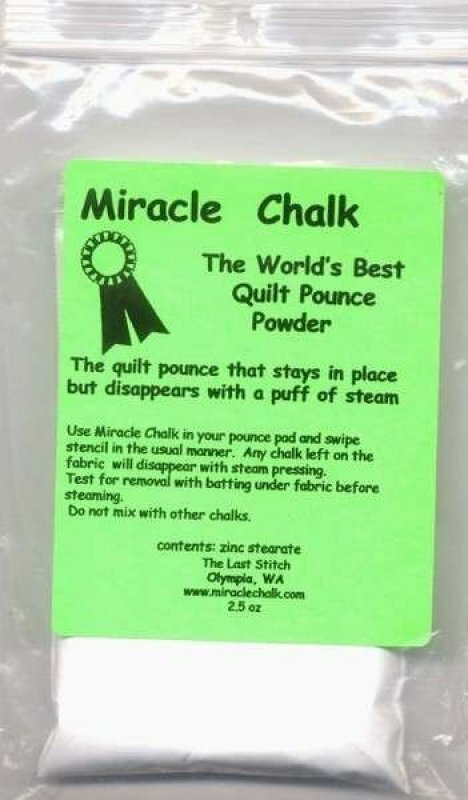 Using your iron on its cotton setting, iron off the chalk. Heat is the removing force. Customers have used hairdryers and steamers as alternatives to the iron. When testing chalk removal be sure to place a scrap of batting under the test when removing with your iron.When testing, if the iron is not hot enough, or you do not have batting under the fabric, the chalk may leave a shadow line. If the iron is hot and batting in place and the shadows remain, do not use the chalk on this fabric. The fabric is either not 100% cotton or the chemicals in the finishing process of the fabric are binding with the chalk creating the shadows. Do not use product with cotton sateen. Remember to test any and all marking products to avoid disappointments.